In addition to showing off its latest OS and software updates, Apple made several hardware announcements at WWDC 2017, including a refreshed iPad Pro lineup. The smaller of the two Pros ditches the 9.7-inch screen, which dates all the way back to the original iPad, for a 10.5-inch panel that fits into a chassis only 10.6mm (0.42”) taller and 4.6mm (0.18”) wider than the outgoing model thanks to smaller bezels. The expanded all-aluminum chassis increases weight by 7% or 32 grams, just enough to notice if you’re familiar with one of the recent models. 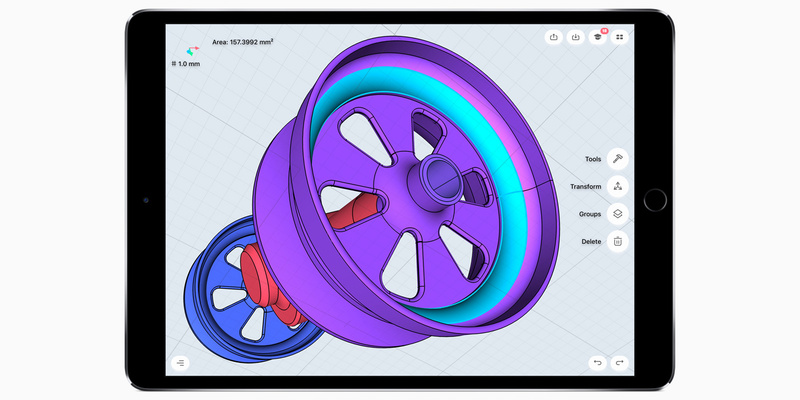 The larger 12.9-inch Pro—first released at the end of 2015—finally gets some attention too. 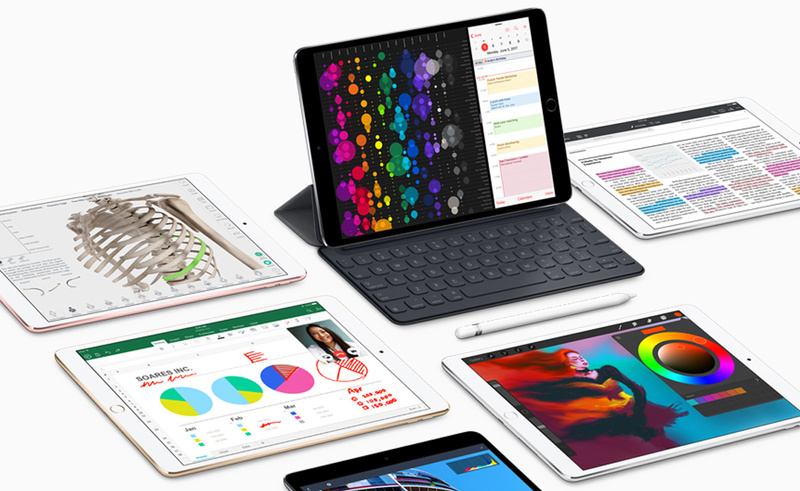 After missing out on the new hardware introduced with the 9.7-inch iPad Pro last year, the big Pro has been brought up to parity with the new 10.5-inch Pro. Both the 10.5-inch and 12.9-inch LCD panels are new for this generation and share the same specifications. The 264ppi panels can display more vivid and lifelike colors by extending color coverage well beyond the sRGB standard with DCI-P3 gamut support. And because iOS supports ColorSync, Apple’s color management system, the Pros’ wide-gamut panels maintain color accuracy by respecting the source material’s target gamut (no overly-vivid, neon colors when viewing sRGB content, for example). Both models also support Apple’s True Tone display technology that adjusts the display’s white point based on ambient light. The idea here is for the screen to replicate what happens to a white sheet of paper under different lighting conditions. If you read a printed book in an incandescent bulb’s warm light, the page will reflect that light and appear warmer, more yellow. True Tone does the same thing, reducing the LCD’s blue output and shifting the white point to appear warmer. Matching the display’s output to its environment is supposed to reduce eye strain, but True Tone can be disabled if it’s not to your liking. Apple claims both displays can hit 600 nits peak brightness, which is impressive for tablets. 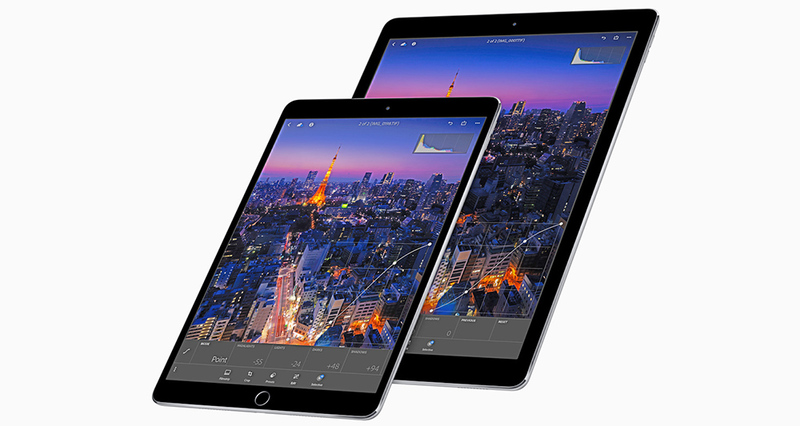 We previously measured the 9.7-inch iPad Pro at 520 nits and the 12.9-inch iPad Pro at 427 nits, so this should bring a noticeable visibility improvement in bright light, especially for the big Pro. Both panels are also fully laminated to the cover glass and use an improved antireflective coating to further improve visibility and diminish eye strain by reducing screen reflections. The improved coating was first used on the 9.7-inch iPad Pro, and after comparing it side by side with the iPad Air 2, I was really impressed with how well it works. Before we move on to other hardware, it’s worth mentioning that Apple is using an adaptive refresh rate on the new Pros, a technology it calls ProMotion. The standard refresh rate doubles from 60Hz to 120Hz, which should help UI animations appear more fluid. It also reduces the Apple Pencil’s latency, making inking smoother with less lag. Driving a panel at 120Hz increases power consumption (panel and SoC), however. To help reduce the impact on battery life, the refresh rate is adjusted down to 24Hz or 48Hz when displaying content that would not benefit from the faster refresh, such as reading an ebook or Web page, for example. Under the display is an Apple A10X Fusion SoC that comes with additional CPU and GPU cores compared to the A10 Fusion SoC used in the iPhone 7. Instead of 2 performance CPU cores and 2 efficiency cores, the A10X Fusion uses 3 of each. It also doubles the number of GPU cores, which makes sense considering it needs to drive a lot more pixels at a higher refresh rate. Apple claims a 30% improvement in CPU performance and a 40% faster GPU compared to the Apple A9X SoC used in the previous generation. It’s still not clear how much RAM the new Pros have. It’s probably safe to assume that the 12.9-inch model still comes with 4GB, but does the 10.5-inch model stick with 2GB like the 9.7-inch Pro? Considering all of the new multitasking features and visual elements in iOS 10/11, a bump to 4GB is certainly justified, although, Apple tends to be frugal with RAM. Internal storage capacity doubles, with the least-expensive models packing 64GB of NAND. 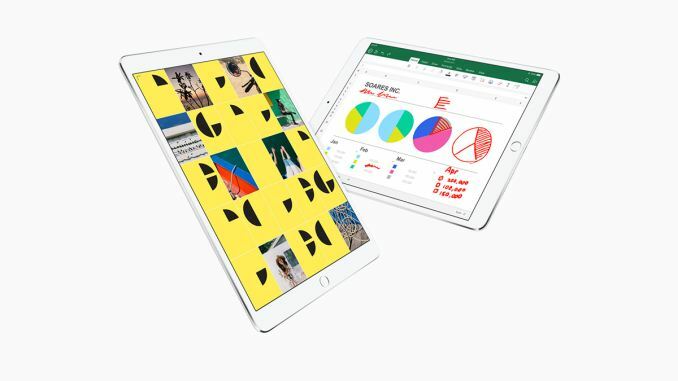 The next two storage tiers jump to 256GB and 512GB, which makes these iPads a bit more competitive with other ultraportable devices targeted at professionals. The extra space is also essential if you plan to use an iPad for less ‘Pro’ purposes such as watching TV shows or movies, which eat up space quickly. The cameras on iPads have always seemed like an afterthought, with Apple using iPhone leftovers a generation or two old. Because tablets typically are not the first device people reach for when shooting photos and video, camera hardware is an obvious place to save money. This is not the case with the new iPad Pros, however, which receive the biggest camera upgrade since Apple first added cameras to the iPad 2. Both the front and rear camera modules are shared with the iPhone 7. That means a 7MP FaceTime HD camera on the front that supports automatic HDR imaging, wide color gamut photos, and 1080p video recording. You can also use the iPad’s display as a flash. Around back is a 12MP camera with 1.22µm pixels, OIS, Focus Pixels (PDAF), a 6-element lens array with a large f/1.8 aperture, and a quad-LED True Tone flash. It also supports automatic HDR imaging and wide color gamut photos and uses OIS and EIS for stabilizing video. The new Pros come with 802.11ac 2x2 MIMO Wi-Fi that offers a peak theoretical throughput of 866Mbps. Like previous iPads, there’s Wi-Fi only and Wi-Fi + LTE cellular variants. The cellular-enabled models get a new Category 9 LTE modem with up to 450Mbps on the downlink. There’s also support for 25 LTE bands and an embedded Apple SIM. 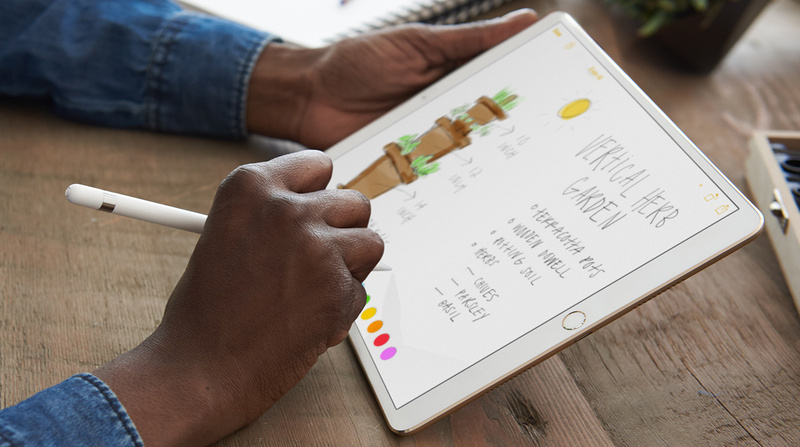 The new iPad Pros look like, well…iPads. The aluminum shell is visually indistinguishable from earlier models and still has a Lightning connector on the bottom, a 3.5mm headphone jack and power button in opposite corners at the top, volume buttons on one side, and an Apple Smart Connector on the other. The proprietary Smart Connector transfers both data and power to optional peripherals such as external keyboards. There are also 4 speakers—2 on the top and 2 on the bottom—that provide better sound than the mono speakers on older iPads and are less prone to being covered by your hands when holding it in landscape mode. The 12.9-inch Pro looks the same as the previous version from the front, while the 10.5-inch Pro has noticeably narrower bezels along the sides of the display. The physical home button includes an upgraded Touch ID sensor (same as iPhone 7) that’s 2x faster. Both the 10.5-inch and 12.9-inch iPad Pros are available for preorder and will begin shipping mid June. Unlike the iPhone 7, Apple is not offering any new color choices for the iPads, so we get the familiar Silver, Space Gray, Gold, and Rose Gold. The Apple Pencil can be purchased separately for $99, and Apple offers its Smart Keyboard for $159 and $169 for 10.5- and 12.9-inch models, respectively. No they didn't. Apple has been very consistent with EVERY SoC release. What they refer to as an x% improvement in the CPU is ALWAYS the single-threaded improvement. The (GB4) speedup for 3x cores is around 2.4x. This might look disappointing but it's actually about what you'd expect. The 2 core speedup (A10) is around 1.6x. Intel gets similarly disappointing numbers, just under 2x for two cores with HT, just under 4x for four cores with HT. IMHO, the best upgrade here is the 120hz screen. I've been anticipating this on smartphones for a while now. Faster refresh rates should be a higher priority than higher resolution screens (>1080p). The rest looks like an iPad. Apple is still charging way too much for these (128GB version at least, a stylus, and a keyboard is well above $1K)... You're better off getting the new Surface Pro if you're into sketching, and everything else. Surfaces, and other new Windows 10 2in1s, are a much better deal; they can actually replace a laptop (for those interested), they're much more powerful, have better input/output, faster storage (expandable), more versatile, and have much, MUCH longer lifespan. >IMHO, the best upgrade here is the 120hz screen. I've been anticipating this on smartphones for a while now. Faster refresh rates should be a higher priority than higher resolution screens (>1080p). 1) Reducing Output Latency with the pencil, note this is not a real input latency (but instead output) but perceived input latency for the screen now updates faster while the previous models had 120 hz sampling for the pencil but not the panel. 2) Reducing perceived output / input latency for finger input which is really not that big of deal like it is with the pencil where you are trying to do far more granularity than you are using with fingers and finger touch targets. But for content besides human ipad interaction the higher response rate has little to no benefits. You'll have to get used to the higher refresh rate screen then go back to the slower one to actually tell the difference. Similar to how you'll probably be ok with 30hz until you try 60hz. I believe finger interaction, especially, benefits greatly in perceived performance and input accuracy. Sure, OLED is totally capable of that and far beyond, but the limit is more likely in power constants of the panel itself and the controller(s). I agree. I have a 144Hz monitor at home and can tell everything else I interact with on a day to day basis has inferior response time. Just how smoothly the mouse moves on the desktop at 144Hz is a simple giveaway. What I am not a big fan of is the adaptive refresh down to 24/48Hz. That drives me crazy on laptops where Intel iGPU's use lower refresh rates to save battery power. It is totally noticeable even for web-browsing and makes it feel like you are surfing on a 15 year old PC. How smoothly they can pull off the dynamic refresh transition is going to be the key. I can't imagine it's going to be transparent going from 24Hz to 120Hz. There will be initial lag. Overall, a pretty good refresh I guess. The storage capacity bump, new panel, new SoC and HOPEFULLY RAM upgrade in the 10" model aren't bad for 12-18 month revisions. It seems unlikely that they will drop to 24Hz just to save power. That seems unlike Apple. The original 12.9" and the first 9.7" Pros both use a variable refresh rate up to, and including 60Hz. Not much is known about Apple's TCON (timing controller) and it's proprietary inner-workings but it does 'slow down' when viewing static images, reading a book, as mentioned or even surfing/reading relatively non-dynamic text rich web pages. I'm floored by both the performance increase and the suppposed display performance and camera upgrades! I remember reading both AT and DisplayMate's reviews of the two and specifically the newer 9.7" -- And their improved display performance along with camera parity with the iPhone (or near... I believe this new one is close to exact as the iPhone 7's). The increase in display performance is amazing considering the reviews of the original iPad Pro 12.9", its successor - iPad Pro 9.7" and most recently, iPhone 7 and Galaxy S8's displays besting previous records --- for this one to be that much better is cool!